Pentagon I gives you the warm, classic sound of the vintage analog synthesizers, combined with the fidelity and precision of virtual instruments. Pentagon I is powerful, and packed with features that offer uncompromised sound quality, with a comfortable and easy to use interface. 4 User Loadable waveform slots, in two modes: Simple cycle and Full range. Includes a Wavetable Library with more than 50 wavetables including synthetic and vintage waveforms. MULTI mode allows turning Oscillators 1 and/or Oscillator 3 in eight individual oscillators. Full Legato mode for monophonic operation. Monophonic/Polyphonic portamento with Fixed or Variable per-key Time. Individual adjustments of Level, Waveform, Mode, Phase, Fine, Octave, Coarse tune, LFO sensitivity and Pitch Eg Intensity for each oscillator. Key Sync, Inverted, Free Running or Fixed Frequency mode selection for each oscillator. Dedicated Pitch Envelope Generator, with Start Level, Attack Time, Attack Level, Decay Time, Release Level, Release Time and fully bandlimited operation. Random Pitch control, with individual generators per oscillator. 4 Operation modes: Add (normal), Ring Modulation, Hard Sync and Frequency Modulation. Every group of two oscillators can select any operation mode. Pulse Width Modulation (PWM) with adjustable depth for every oscillator and phase shift control by a dedicated LFO. The width can also be changed manually (real-time) or with a Envelope Generator. 5 Pitch Bend modes: Normal, Asymmetric, High Note, Low Note, Hold Notes. Pitch Bend range adjustable up to +12 semitones. 2 Superb resonant multimode filters (Low Pass, High Pass, Band Pass, Notch) with individual adjustments for Type, Cutoff, Resonance, Envelope amount, Velocity, Keyboard Scaling, Aftertouch, Breath controller, Modulation. Link mode for the two filters. Dedicated LFO's, for Pitch, Filter and Amplifier, 13 waveforms each: Sine, Square, Pulse 50%, Pulse 25%, Pulse 12%, Saw Up, Saw Down, Triangle, Step 1, Step 2, Random 1, Random 2, Sample and Hold. Variable offset of all waveforms, Delay, Fade, Speed Depth, Aftertouch, Breath and Modulation controls. All LFO's are individually syncable to Host Tempo. 2 Amplifier dedicated Envelope Generators with Attack Time, Hold Time, Decay Time, Sustain Level, Release Time, Keyboard tracking and Velocity control. 2 Filter dedicated Envelope Generators with Attack Time, Hold Time, Decay Time, Sustain Level, Release Time, Keyboard tracking and Velocity control. Positive or Negative envelope modes. Drive stage with tone control. Amp and Cabinet simulator, with 19 different recreations of vintage cabinets and amps plus synthetic environments. Formant Filter makes Pentagon I "speak" vowels. Once this effect is on, the Drive knob will select the vowel (AEIOU). Map this knob to any MIDI controller, aftertouch, breath, etc to play the vowel via MIDI. Formant Filter can be also modulated with Filter LFO. Filter Limiter to use high Resonance settings without clipping (one limiter per voice). Broad range of Chorus, Flanger and Phaser effects available, including mono/stereo and 4-voice chorus and phaser. Stereo, Ping and LRC delay effects, which syncs to host tempo. Individual time settings for L and R channels, feedback and level controls. Two band quasi-parametric equalizer, with adjustable frequency and ±12dB range. Master volume control for the whole instrument (all presets). 4 outputs: Main stereo pair (with effects), 2 auxiliary mono outputs (dry), or sterep output versions. A Voice Modulator allows you to control Pentagon I sound with your voice or any external audio source. 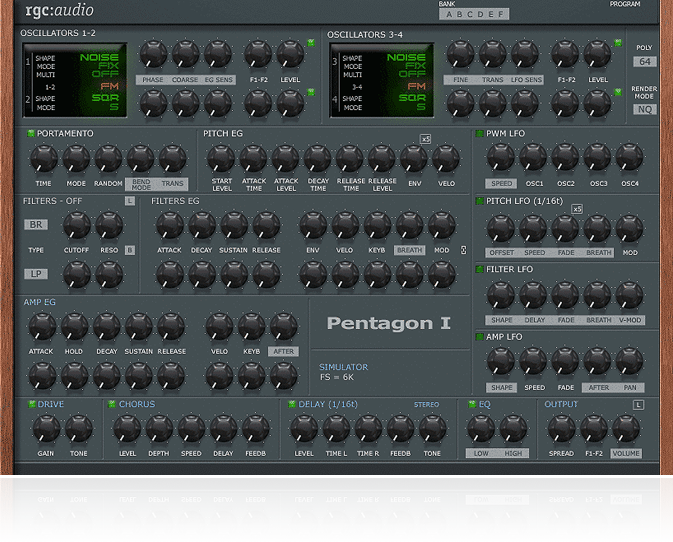 Just turn it on, use Pentagon I as an effect and send MIDI to it (don't worry, you don't need to sing in tune).